"I have no idea why kids are wasting their time in classrooms with teachers, hard copy textbooks, and overhead projectors." 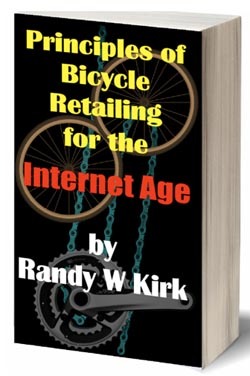 This provocative statement comes from author/speaker and bicycle industry old-timer Randy Kirk. "Give me an iPad and a curriculum, and I'll turn out better students in a fraction of the time." Since Kirk is not in education, he is unleashing his theory on the industry he has serviced and enjoyed writing for over the last 30+ years. The new Principles of Bicycle Retailing for the Internet Age is going where others fear to tread. "The first run of the hard copy books will ship just prior to Interbike 2011. We will bring 300 copies to the show, but expect those to be gone in hours. Principles of Bicycle Retailing III sold 3000 copies when there was only 6000 dealers in the US." The book, with 47 profit packed chapters, will be backed up online, and it will be evergreen. Purchasers of the book will be given access to a members only portal at http://www.BikeShopOwner.com. Online, the dealer will find an amazing array of aids for his business. There will be video tutorials for staff members, interviews with industry experts on audio and video, examples of state-of-the art interiors, signage, displays, and more. Says Kirk, "The book will always be current. Google + is coming, but the business application will not be public prior to publication. We already have a blog set up for Google +, much like the huge blog we have for Google Places. The dealers will have access to the most current information on how to exploit Google + at the portal." In addition, there will be a weekly newsletter going out to let members know what has been added to the portal. According to Kirk, "Everything we do in the portal will be 100% in detail. Unlike some online resources, we won't be holding back the 'secret stuff.' If we know the 'cheat,' we'll pass it along. However, everything will be 'white hat." We don't believe in short term advantages in internet marketing that might ultimately result in long term damage." The book won't be the only thing in booth 34087. It will be crammed with video lights, cameras and equipment. Dealers will be invited to tell the story of their store and their top bicycle in a two or three minute interview. This will then be professionally edited and uploaded to YouTube. The dealer can also use the videos for the website, blogs, FB, or email blasts. Prior to Interbike, Kirk will be participating in two seminars. The sponsors of the first webinar, Clean Motion / RhinoDillos, are introducing what will be the most talked about under $30 retail item in the bicycle industry over the next 6 months. Clean Motion has launched a massive advertising campaign to tell the story of the first improved bicycle tire liner since Mr. Tuffy went dual density. Says Kirk, who built both the Mr. Tuffy and the StopFlats 2 brand into prominence, "It is unclear to me why the current brands have failed to keep up with changes in available plastics. The RhinoDillos are lighter and tougher against flats, and laboratory testing proves it." The webinar will be titled "Ignore Google Places at Your Own Peril - How to Optimize Google Places," and take place on September 8 at 1:00 California time. At the Interbike Show, Kirk will be the leadoff speaker in the NBDA Super Seminar Retail Education Series, taking the platform at 10:30 on Tuesday September 13. His seminar will be titled, "Secrets to Page 1 Visibility on Google Search - Websites, YouTube, Yelp, and Google Places."